When we first launched Popspotting and asked for your recommendations on TV shows to watch, “Justified” was one of the most popular suggestions. So this week, after working our way through most of the first season, we share our first take on this FX series. 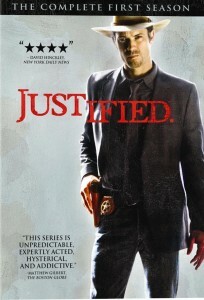 Created by Graham Yost, “Justified” stars Timothy Olyphant as deputy U.S. Marshal Raylan Givens, a character from stories by Elmore Leonard. Set in Harlan in Eastern Kentucky, Raylan enforces his own brand of justice while coming to terms with the people and problems from his past. The series also stars Joelle Carter as Ava Crowder, Natalie Zea as Winona Hawkins, Walton Goggins as Boyd Crowder and Nick Searcy as Art Mullen. As of this podcast, we’re four episodes away from the Season 1 finale, and looking to pick up Season 2. The series has been renewed for a third season, which won’t air until next year. So, “Justified” fans, have we done “Justified” justice? Is there anything great we’re still missing? This entry was posted by Ryan on July 4, 2011 at 5:14 pm, and is filed under Podcasts, TV. Follow any responses to this post through RSS 2.0. You can leave a response or trackback from your own site.